Refer to the Program Admissions and Enrollment Process after this section. 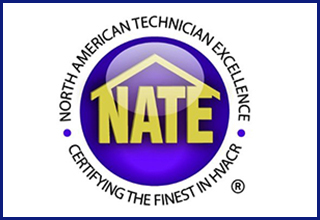 North American Technician Excellence (NATE) is the nation’s largest and most recognized non-profit certification organization for heating, ventilation, air conditioning and refrigeration technicians. NATE certification tests represent real-world working knowledge of HVACR systems. Developed by a committee of industry experts nationwide, all the NATE tests are rigorous, knowledge-based, multiple-choice tests designed to validate a technician’s knowledge. You can read more about NATE at: www.natex.org. The current edition of the Cengage Refrigeration & Air Conditioning Technology textbook is included in the tuition for this program and is shipped shortly after enrollment. Four HVAC Industry Exam fees are included. Reimbursement for these fees is issued when a student submits proof of passing each exam and copy of each paid invoice or receipt. Online Training - The online program is a Career Technical Education (CTE) model. Courses are entirely online with access 24/7/365. Class is always open. Student support is provided by our student services crew and faculty instructors through email, chat, our campus messaging system, and phone. Note: The 101 Fundamentals course for Program Students requires that students must pass each module exam with a score of 75% or higher before they can move on to the next module. Once this strong foundation is established in the 101 course, students can then move through the remainder of their program at their own pace, one course at a time. Note: For complete individual course descriptions, go to the corresponding course number in this Catalog. This program qualifies for our pay-as-you-go in-house financing.